The shallow kick may not be fashionable at present, but that trend could change any time. There are unique touches, in particular the luxurious black chrome, so you can't assemble a similar (cheaper) kit from standard Yamaha stock. This is one for the serious fan with money to spare, an investment in a timeless classic. Quality, rarity and collectability. The signature of one of drumming's true greats. The price and lack of availability. A beautiful example of drum making. All the toms have the YESS mounting brackets. Steve Gadd: One of drummings true greats. The luxurious black chrome is unique. During the '80s Steve Gadd was acknowledged as the world's most influential drummer. He set drummers a new standard of accuracy, sound and passion, which remains the ultimate yardstick today. Luckily for Yamaha, Steve joined their ranks in 1976 and got involved with designing their revolutionary Recording Custom 9000 kit, which itself set the pace for several years. When Yamaha updated its range 10 years on, Steve took delivery of his new kit, which is essentially the same as what you see here today. When you think of Yamaha, you imagine this colossal corporation, yet all Yamaha's pro drums are handcrafted by a select team of 60 in a small Japanese factory. Where Yamaha's broad resources do score is in the cross-fertilisation from one corporate branch to the next. So Yamaha's hardware is wisely made in their Indonesian motorcycle factory. And, going back to 1976 again, one of the major reasons the RC-9000 was such a hit was that it applied Yamaha's expertise in piano lacquering to its drum shells. Yamaha's pianos are sensational looking hunks of furniture, and Steve Gadd had a say in applying this special acoustic finish to his first RC-9000 kit. Steve has stuck with solid black and today's signature kit is as lustrous as ever. The kit is actually an amalgamation of four birch toms with a maple bass drum and signature steel snare. There are two mounted toms, a 10"x7½" and 12"x8", plus two floor toms, a 14"x12" and 16"x14". All the toms have the YESS (Yamaha Enhanced Sustain System) mounting brackets. These are unlike most other companies' which generally follow the RIMS principal of mounting from the hoops and lugs. Yamaha has instead boldly gone for bolting a receiver block to the shell. The block is positioned along the nodal circumference, which is the line of least interference. It should also be noted that the small toms are mounted on a bass drum tom post, again something which many other companies no longer do - undrilled bass drums are the thing today. Fixing a tom mount on the kick drum results in sympathetic resonance between the toms and the bass drum. You either like this or you don't and Steve obviously does. The two big toms are mounted from floor stands rather than on legs. The floor stand was another of Gadd's early innovations. As was the use of shallow 'floor' toms, which - suspended in this way - led to the now-universal fusion kit. Also, before Gadd, every kit had 12" and 13" mounted toms, but he requested a 10". Now it's almost standard issue. There's so much we owe to this man. Small drums record well and, as the leading session drummer of his day, Gadd led the way with big sounds from smaller toms. In his words: "You can loosen up a small drum and make it sound big and deep. You can also tighten it up so it speaks with a high pitch. But you can't get a 12" drum to go that high without choking up." Suffice to say all the toms in this set have a wide tuning range, serious punch, depth and control. Like the man himself they ooze quality. The medium-thin shells are straight-sided (no reinforcing rings), six-ply birch and have a dark, stained interior finish. They're the same shells as the original 9000s, but with different lugs. The metal hoops are die-cast aluminium, finished in black chrome. This is quite different from the black powder coating you occasionally see and which can easily scratch. This is black plate and it looks altogether better, extra thick with a satiny-plastic appearance. You get the feeling it will last. The contrasting normal chrome lugs are also buffed to a brilliant shine. Like everything else, Yamaha's pro-spec chrome is made to last. The small button lugs are from the Absolute range, and are attached at the nodal point again, with just one bolt each for minimum shell interference. When Yamaha, like all the Oriental companies, added traditional American maple to their ranges in the '80s , Steve swapped his RC birch bass drum for a maple shell. Accordingly, his kick is a Maple Custom which has 10 plies and is 10mm thick. This is thicker than most top- end bass drums today. Indeed, Yamaha's Maple Absolute bass drum has a thinner, seven-ply shell, but Steve prefers the heftier Maple Custom. In line with the toms, Steve's 22"x14" bass drum is shallow by today's standards. Virtually all bass drums were 14" deep up until the '80s when 16" 'power' depths came along. Like deep toms, deep bass drums do give a deeper note, but they correspondingly lose speed and impact. The fashion today is towards shallower toms, matched with ever deeper bass drums. But this 14", fitted with a Pinstripe batter and large front miking port, has a kick like a mule, responds just as fast and lacks nothing in depth and volume. 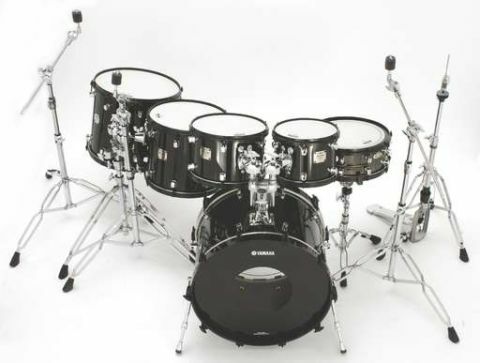 In keeping with the overall theme, the bass drum has black tension claws and wing rods (rather than drum key tightened bolts), with black lacquered wooden hoops. Steve has a line of several signature snare drums but this is the one he uses most frequently. The shell is 2mm thick, black nickel plated steel with 35º bearing edges and 3.5mm deep snare bed. There's a concave strengthening bead around the centre and 20 separate chrome lugs, top and bottom. The drum has the same die-cast black chrome hoops as the toms. The throw-off is from the Absolute series, a handsome side-lever design, simple but firm in operation. Its narrow, 10-strand snare, attached by cords, is also a signature item. Steve Gadd's 20-year endorsement of this set-up is all anyone needs to know. It's a beautiful example of drum making. No unnecessary frills, just spot-on shells, low-mass lugs and a stunning, Japanese lacquer finish.